Hello there. Hope everyone is well today. This is senior week at school and almost the end of this year school so it's been a little crazy in my world. I am joining in with Gill's Inspired by Challenge over at Art Journal Journey today. This is a spread from my Japan Travel Journal that I have been working on lately. I was inspired by some of the sights I saw while traveling and also some classic Japanese images we are all familiar with. Here's the side I made with some markers and paint to remember my visit to the bamboo forest. And on the other side of the spread I used the envelope to a hotel room that had my key as well and some classic Japan images. For some reason this tag didn't want to photograph with the actual color. Red it a tough color to get right. I stamped this envelope to make it a little more exciting. I'm on a roll with my Japan Travel Journal and haven't been working on much else. In 2 weeks I will have a lot more time to spread my art wings and I am looking forward to that. :) Tomorrow night is graduation at my school so even though it makes a long day it is nice to see such a happy finish not only to the school year, but to say goodbye kids I have known for a few years. I have also decided to put in for retirement in 2 years. I think I will at least-it's such a tough decision-there's so many factors besides the job to take into account. I need to put in so early because I have a lot of accumulated and unpaid sick days which they spread out over 2 years of my salary. I guess there is part of me that is ready to go now and part of me that isn't and it is hard to plan 2 years out because so many things can change. Any of your retired folks have anything to say about that? Thanks for visiting. I always appreciate your visits. I love your bamboo forest - so cool and the page with the envelope is lovely as well! You are a pro with journaling and scrapbooking skills my friend! I just can applause you. Thanks a lot for another fabulous entry linked to Gill's AJJ theme! You rock again even if you are working hard! I appreciate this very much my friend! Each day earlier to become retired is a gift ..at least in my eyes! 2002 days until I get my first retirement money then. And it will be quite a fair sum as they pointed out. I am just so happy about every single day that is mine - alone mine!!! So - I just can tell you: A good decision dear Erika! Wonderful spreads. I really like the bamboo forest against the florals and on the opposite page. Himself just retired. the school/state offered him a package that was too good for him to pass up. They are giving him a lump sum of his unused sick time. He didn't have to put in early for that, but maybe MA and NH have different rules. Even though he has retired, he will still be teaching. He's doing Summer I which will end at the end of June. Then back in Sept. for his full class load. (How is that retiring?!?!) He will lose his full time Prof. status to become an adjunct prof. He's happy as he will no longer have to attend meetings or being on committees. I'm thinking once the Winter semester comes along, he'll skip that so he no longer has the long commute made worse by weather. So even though you retire from teaching school, you still can work and do other things if you want. Your Japan travel journal is looking really good. I love the Bamboo Forest. Your bamboo looks perfect. I really like that you saved your key card holder from one of the hotels you stayed in. That was something I would do, too. It's a great entry for Art Journal Journey, and I'm so happy you shared it with us today. My friend Sally is retired and we have had numerous talks/discussions about things like her decision to do so (it's been about 10 years, now), her spending habits, and living on a fixed income. At first, she wanted to get a part time job, but quickly changed her mind. She said a lot depended on her tenure and number of years she put in at all the schools she worked in (she was a school psychologist with a master's degree, and not a teacher). 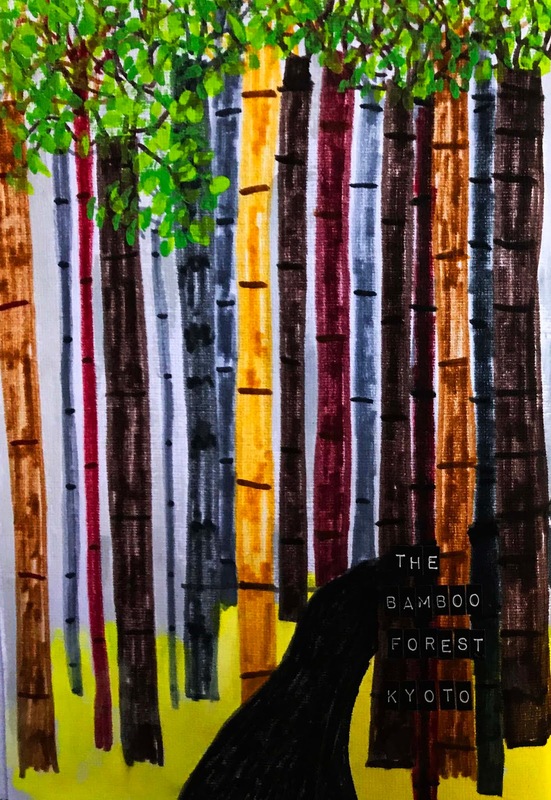 I remember how I felt when I saw your photo of the bamboo forest, and your art beings that feeling back. I can almost feel what it must have been like to be there. I'm guessing you'll miss your work but that you'll have no trouble finding constructive and creative and relaxing ways to spend your time. It would be hard to make the decision so far out! This is a fantastic page Erika !! I love the bamboo forest, and the hotel envelope with all the details is just fabulous. Lovely! Sometimes we have a hard time making some decisions that affect us as deeply as retirement, even if it is anticipated. The good thing is that we have a lot of free time to do many of the things that we have pending, and enjoy a little more of everything. Decide what you decide, all will be well Erika. 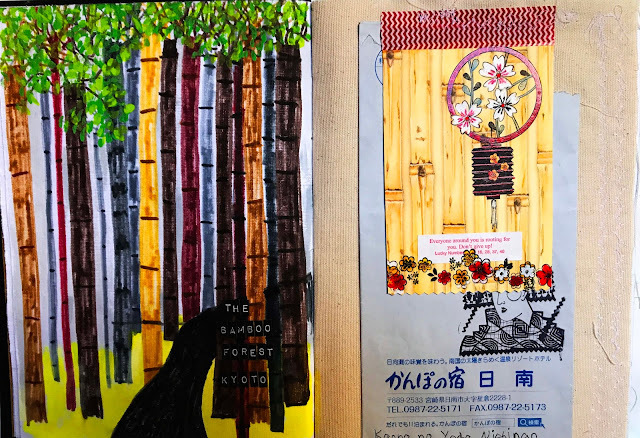 Two fabulous journal spreads Erika, I love the bamboo forest and you used a wonderful stamped image on the envelope. When I read that you planned to think about retiring in two years time, I felt very happy for you. Its never an easy decision to make, but I can say not having to go to work is one of the best choices I have ever made. I have been retired for a long while, the days are mine, they are full, I am never bored. Yes you have to make adjustments to your lifestyle and health is an important factor as we get older. OH is also retired we are free to go out, travel, stay home. So yes I can recommend retiring. It is the beginning of another adventure in life's journey. Fabulous spread Erika - a lovely way to remember the bamboo forest and a great way to use the lovely ephemera that you collected on your travels. Have a lovely day and evening at the graduation.. I love your travel journal to the max. And I can't wait to have more pages and happy you'll have time to work through them. 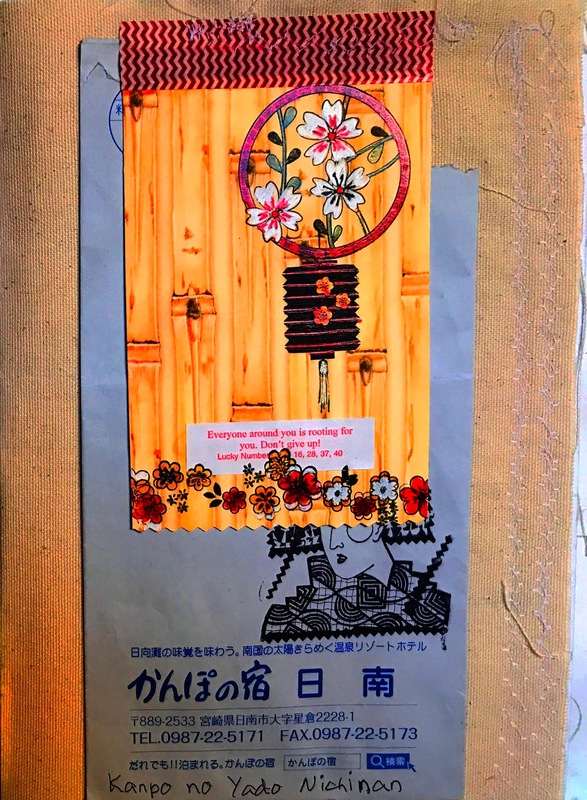 Hello Erika, I love your Japanese art, it is something different and interesting to us. Only you can decide whether you want to retire or not, but I have actually never met anyone who regrets it. I think you have to have something "to do" (as well as a lot of loafing about of course!!!) but from what I read on your blog I don't think you will be struggling on the something to do front. I really like your bamboo forest! The whole double page looks very Japanese with all the details! If you know what to do with your time after being retired then do it! 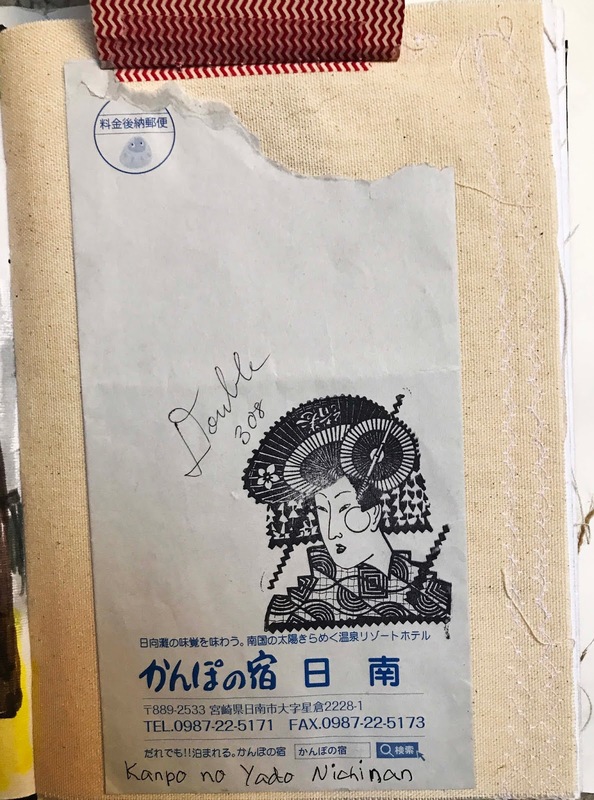 I really love that Japanese (Geisha?) stamp that you used on the bag...it is really classic! Your travel journal sounds amazing...a wonderful way to remember your trip. Beautiful work! Ooh, you got to visit a bamboo forest? Wow! What an experience. More lovely ephemera and another great memory page in your lovely journal.